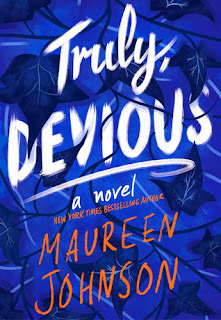 Truly Devious has been on my radar for a few months, and I was so excited to finally get my hands on a copy! The novel is mainly set in the present, but it flips back to 1936 as well. The novel begins with the mystery of the Ellingham family murders/disappearances in 1936, but we also follow along as another mystery unfolds in the present day. Stevie, the female lead, was obsessed with solving mysteries and determined to figure out what happened to Mr. Ellingham's family. She stopped at nothing and questioned everyone until she found what she was looking for. The characters were all unique and had very different personalities from each other, and I really enjoyed getting to know each of them. Another thing I loved was how there were two stories happening at once. It definitely added to the suspense of the novel. Every time I thought I was going to figure out another clue, it would switch to a different story line and leave me hanging, which I loved! All in all, Truly Devious was a fun and fast paced read that I would highly recommend to readers who enjoy YA mystery novels. The only thing I didn't absolutely love was the lack of resolution at the end of the novel. It was obvious that there will be other novels in the series, but I would have loved to have been left with a little more information at the end of the first novel. Oh well! It just makes me even more excited for book two! Thank you to Katherine Tegen Books for sending an advanced copy of the novel in exchange for an honest review.